Why are my apple tree’s leaves wilting and dying in May? Winter injury on apple trees is common in Minnesota. When a tree has been injured by winter temperatures, it is normal for the branches to leaf out in the spring and then wilt, or not leaf out at all. While the affected branches die, the tree will usually still produce fruit since often only a portion of the tree is affected. How do I plant a fruit tree orchard? Gardeners, farmers, or organizations aiming to install large plantings of fruit trees should establish a management plan and business plan (if applicable) prior to planting. Fruit is enjoyable to grow and share with others, but these trees are also a significant investment of time, resources, and space. Also, be sure that the fruit you are interested in can be grown in Minnesota. Fruit trees, small fruit, and grapes should be pruned in the winter when they are dormant. The best time to prune is from February to April, after the coldest winter temperatures have passed, but before the trees bud out in the spring. For more information on pruning apple trees, watch our 3-part video series. What are the best varieties of apples to plant in Minnesota? 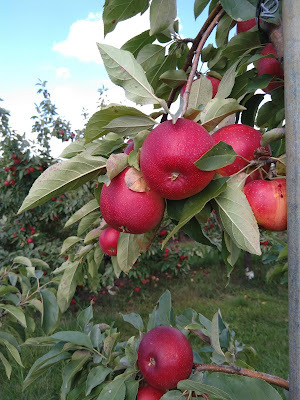 We can grow many wonderful varieties of apples in Minnesota, beyond what can be found at a typical grocery store! For a list of recommended apple varieties for Minnesota, read this article on growing apples in the home garden. What can I do about apple curculios? While plum curculios are more common, an increasing number of home gardeners are also encountering apple curculios. The adults move to apples in the spring and damage developing apples by making small punctures as they feed and lays eggs. This damage can also cause apples to become lumpy and misshapen. The oviposition punctures, unlike plum curculio, are small and round and not crescent-shaped. Management is similar as plum curculio, including a well-timed insecticide treatment at petal fall. Click here for more information. Japanese beetles feed on the leaves of many fruits, such as grapes, apples, and raspberries. Management is challenging and can require a lot of time and effort if infestations are severe. When one or a few beetles start feeding, the damage leaves gives off a chemical volatile that attracts other beetles. Because of this, a few beetles can appear to escalate into many in a short period (also why you can find many on one plant and few on adjacent plants). A common recommendation for home gardeners is to regularly brush them off into a bucket of soapy water or vacuum them. There are also a variety of insecticides that are effective against Japanese beetles; Neem is an example of a low impact product. Episode 12 of our pest management podcast, “What’s Killing My Kale? ": How Much Do We Really Know About Japanese Beetles? How to manage spotted wing drosophila? Spotted wing drosophila is an invasive fruit fly affecting soft skinned fruit like raspberries, strawberries, blueberries, and grapes. They lay their eggs directly into the fruit, softening the fruit. It is challenging to manage completely, but management recommendations for home gardeners include exclusion netting, frequent timely harvests, cold storage of harvested fruit, and selection of fruit types that ripen early in the summer. Some growers also use insecticides as part of their management strategy for SWD, as it is difficult to completely control SWD without them. Can I grow peaches, apricots, and plums in Minnesota? These tender stone fruits can be grown in Minnesota, but may not yield fruit every year. They bloom early in the spring, so late frosts can kill their blooms, meaning no fruit for that year. Peaches are the most cold sensitive of the fruits listed above. Some varieties of stone fruit are certainly hardier than others, so be sure to select varieties that are rated to grow in USDA Zones 3 and 4 (the hardiness zones in Minnesota). For information on growing stone fruits in the home garden, click here.